Here’s some news that’s not all that surprising, Volkswagen’s Routan minivan, essentially a rebadged Chrysler minivan, is on the chopping block. You could pretty much see this coming from a mile away, almost before the Routan was rolled out. Rather than design and build their own minivan (a class of car that VW invented with the Type II way back when) VW decided that a better route was to take Dodge’s Caravan, change the trim here & there, add a VW badge and give it an Euro-sounding name. The Routan was built alongside its Chrysler Corp. counterparts at Chrysler’s Windsor, Ontario, plant until last December, when VW asked Chrysler to stop production. Apparently, not a single Routan has rolled off the assembly line since, and there are no immediate plans to resume production according to sources. Routan production started in September of last year, and the Windsor plant cranked out 22,037 Routans. The problem is, VW only sold 5,582, which is less than a quarter of those made. That much rolling stock sitting around explains Volkswagen’s incentive programs to move them off dealer lots, but even that hasn’t been working. Routan’s retail price is still a couple grand higher than a Dodge Caravan’s, and it actually isn’t a bad minivan. 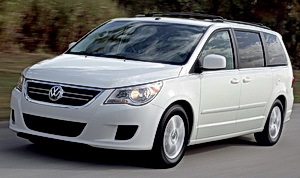 The Routan is the best-driving Chrysler minivan sources say and also boasts the best interior of the bunch. So even if the Routan is going away, the bright spot here is that there’s tons of them sitting on dealer lots, and they are desperate to move them, and they’ve got incentives up the whazoo. So if you’re in the market for a minivan, good deals should be available at your local VW dealer.